Four Animal Science students currently serve as the 2018-2019 Animal Science Student Ambassadors. They are: (2nd year Ambassadors), Lexi Ostrand and Hannah Esch, (1st year Ambassadors) Kaylee Wheeler and Danny Ahern. 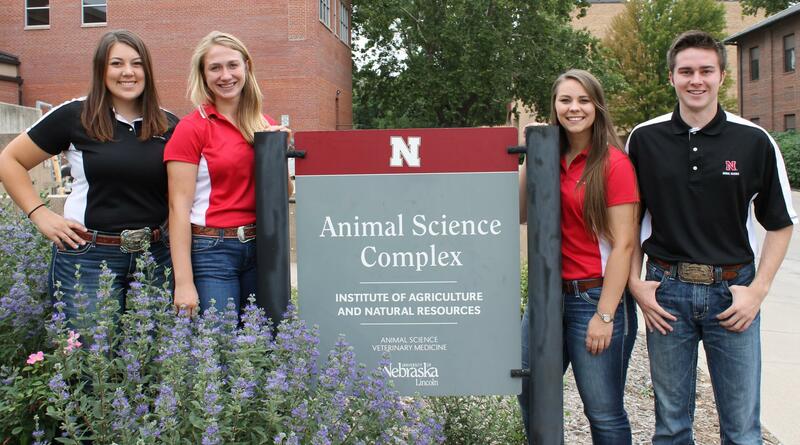 These students promote University of Nebraska - Lincoln Animal Science and help recruit prospective students. Each Ambassador is responsible for at least one project or event each year, and assists with the projects of the other Ambassadors. This year the Ambassadors are coordinating several events, as well as providing tours for prospective students, helping with recruitment mailings, attending high schools to visit about career opportunities in Animal Science, and much more! Do you have a question for the Ambassadors about being a student in the University of Nebraska - Lincoln Animal Science Program? University of Nebraska - Lincoln Animal Science Online Information Request Form!